A promotion video was created by Mike Morgan to promote enrollment in the pathway culinary arts program to Shasta College. 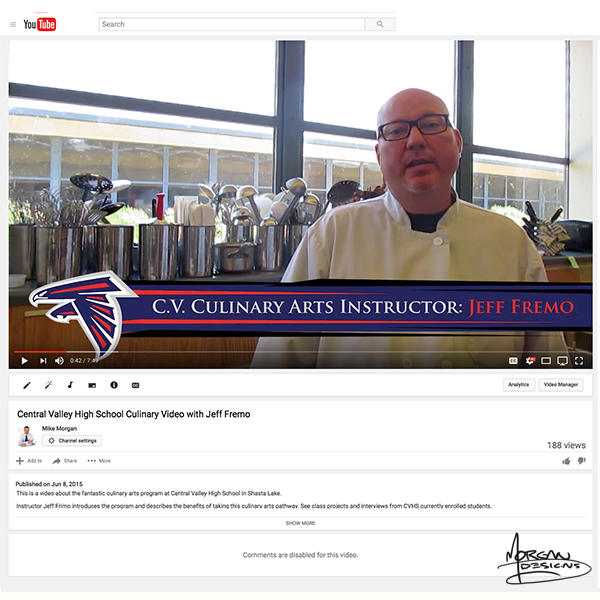 This is a video about the fantastic culinary arts program at Central Valley High School in Shasta Lake. Instructor Jeff Frimo introduces the program and describes the benefits of taking this culinary arts pathway. See class projects and interviews from CVHS currently enrolled students. The pathway classes includes Culinary Arts 1, Culinary Art 2 and the Shasta Trinity ROP program. If you are interested in enrolling in this program contact your Central Valley High School counselor or contact Jeff Frimo.